Our blog has been around a little over two years now and we have published over 300 posts. We watched two other wiener dogs so we had 4 at our house. 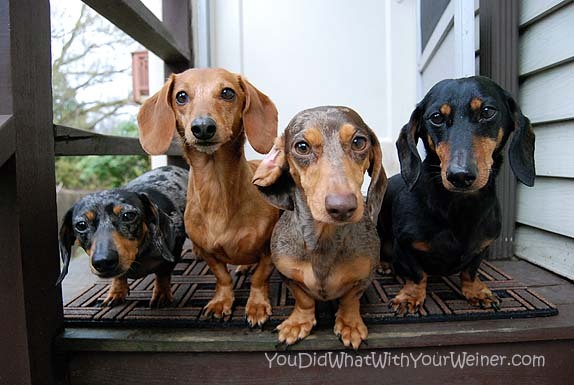 I think this post was so popular because everyone loves pictures of multiple wieners. People are often surprised that small dogs can hike and there aren’t many people out there writing about it. 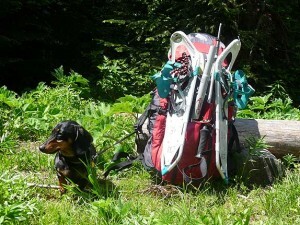 It’s has probably been a popular post because people who don’t hike with their small dog are intrigued and those that do know that is awesome and are curious what I had to say about it. It’s hard to find jackets to fit Dachshunds. When you do find them, some of them are pretty expensive and/or can’t be thrown in the washer. It’s muddy on trails here in Seattle so we need to be able to wash our jackets often. These custom-made fleece jackets are very affordable and our favorite ones we own. 2. How Many Calories Do You Burn Walking Your Dog? The #1 Most popular post of all time was the recent post How Do You Sleep at Night? This post just goes to show that you (ok…me and other bloggers) don’t always have to work for hours on a post to come up with something people like. For some reason people really identified with my poorly drawn schematics of how the four of us (me, my husband, Chester and Gretel) all sleep in the same bed. You have definitely had some good posts over the last few years. I’m looking forward to many more good ones as you go along! What a great post!!! I never thought of doing one like this…now you have given us a great idea!! Love that picture! Sometimes the popular posts are surprising but in your case, I think all five make perfect sense. These are the posts that reach wider audiences, beyond just the pet blogging world. I’ve probably googled the title of number two several times and I am sure I am not alone! Congratulations! It’s been a great couple of years … and here’s to many more!